During all the garage sale excitement last Friday, the mailman dropped off this ‘SO sweet‘ blogger RAK from Nicole Cooke. It’s adorable! I love her attention to detail, like: the paisleys over stamped on the big blossom, the crisp and thick black embossing of the sentiment and the hint of red around the edges of the white cardstock (a different take on the ‘fall back on black’ method). 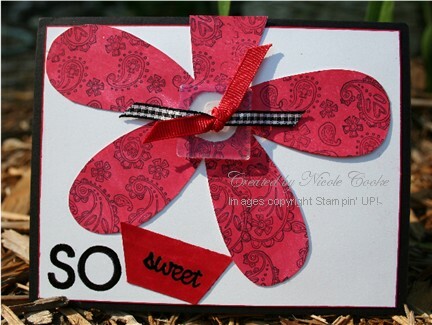 Make sure you check out her blog Stampin’ Library Girl. You’ll be glad you did! Nicole, thanks for thinking of me! What a great card! Lucky girl! Lori, I’m so glad you liked the card!! This is such a pretty RAK!! Nicole does nice work!